If I were them, I wouldn’t “Let It Go” either. It’s been a little over a year since the biggest Disney Princess movie in history had every household belting out the Let It Go at the top of their lungs. So what have the Frozen directors have been up to since then? An all-new Disney short, Frozen Fever! 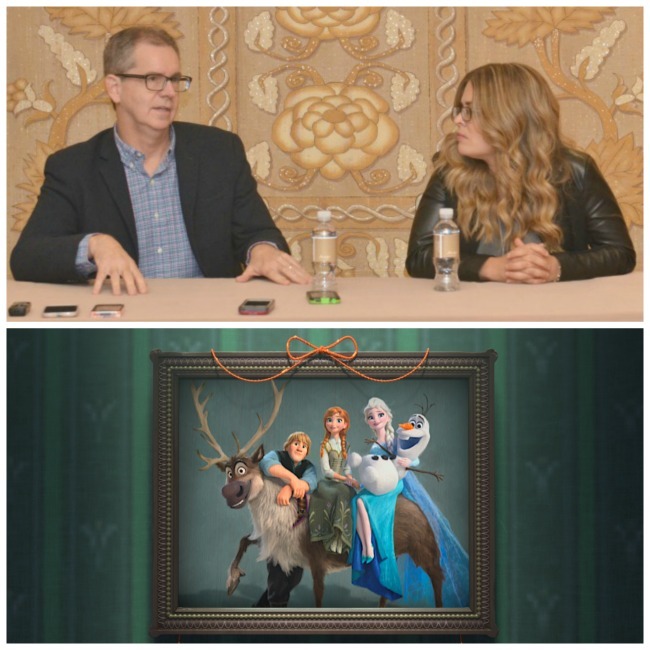 We’re laughing and sneezing with Frozen Directors Chris Buck and Jennifer Lee today as we find the inspiration behind the newest Frozen Fever short, how their lives have changed since the first movie and what’s in the future for your favorite Frozen characters. So grab a drink in your hand, and your snow up against the burning sand wait, wrong movie, and get ready to celebrate Disney Frozen all over again with our Frozen Fever interview! 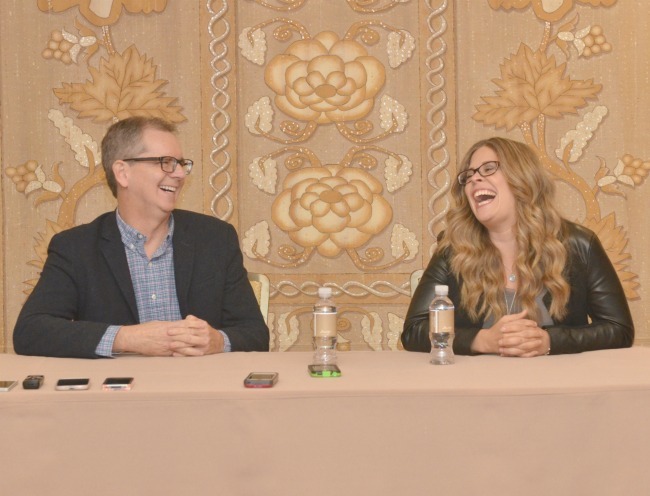 Sitting with Chris Buck and Jennifer Lee for an interview is like sitting on a couch with Olaf…and Olaf. They are just a happy, go-lucky pair of directors that really love the Frozen impression they left on the world. Full of life, laughter and definitely interrupting and finishing each other’s sentences, this was a seriously FUN interview to be a part of. I mean….Frozen! So keeping in mind that Olaf mentality, just imagine that you’re now sitting on the couch with Chris Buck and Jennifer Lee. When one person is talking, imagine the other one going “Yeah, yeah, uh-huh” in the background while smiling and shaking their head. Ok, got that picture? Now we can begin the interview. So it’s been a year. How are your lives now? Jennifer Lee: We’d thought they’d be less busy, but they’re not. Chris Buck: I still buy my shirts at T. J Maxx, so that hasn’t changed. Chris Buck: Since we first last talked, it’s been overwhelming, the year. We still get YouTube sent to us. I mean, I got one just yesterday…mash-ups. All this kind of stuff. Frozen and the Thing together…It’s a Claymation thing. It’s actually very funny. So it’s been overwhelming. It really has. Sorry. We’ll get serious right away. But we did the Reddit Round Table. Reddit round table is where a woman wrote in saying that she was in a bad place and was gonna commit suicide, and saw Frozen and inspired by Elsa and, and her journey, and she said, and I’m still here. Thank you. So, you know, we’re overwhelmed by that. There are autistic kids that watch Frozen that parents tell us they don’t sit still for anything, and they watch Frozen, and they relate to Olaf. Just a few weeks ago a friend of ours working at a nursing home, and a senior citizen [was] sort of internal and not doing much. And she watched Frozen. And then she started drawing again. ‘Cause she used to draw when she was younger. And she was drawing the Frozen characters. And her husband was just so grateful she was coming back to life. So you get those are the stories that we go oh wow. And that’s how I think our life has changed. We always knew that these films had some influence and power. But this one, certainly I’ve never experienced anything like this. Jennifer Lee: It’s still a surprise everyday. It’s still surprising us. Are you sick of “the” song? Jennifer Lee: I have to correct that, ‘cause it was a joke about we actually have parents coming up to us going “thanks.” [in sarcastic tone] You know? And so we just go sorry. Like, kidding. What are you gonna do? I always say I think when I’m very old, the last thing left in my head will be Let it Go, and that’s just fine with me. Chris Buck: There was a Youtube, Choke Frozen. Have you seen that one? It’s just a woman with her snowed in daughter and you hear in the background “let it go, let it go, let it go, let it go.” It’s very funny. Chris Buck: Some of the ideas started with……you know, she would have this stuff, but then suddenly, like, spikes would show up in Arendale. And we’re, like, no, we did that before in the last one. Jennifer Lee: Create something else. And a sneeze does this, and blowing your nose does that. Like, we had all of these crazy… Does she know? Does she not know? So there were still hours of what do we do? What if? We just… You felt it when he suggested it. We all just went yes. Chris Buck: And it gave us license to have fun with Elsa. So from beginning to end, how long did Frozen Fever take? Jennifer Buck: ….two weeks ago. Jennifer Buck: We’re bad at math. Apparently, we’ve been called out for saying it’s a few months later. It’s 11 months! Okay! Chris Buck: But production-wise, like when we started animation or layout, it was probably August, wasn’t it? Jennifer Buck: Yeah. I think in layout. We recorded voices in beginning of August. And so we have most of the writing and working with the songwriters was June through the end of August. to each other. Okay. Here’s this. Here’s my version for now of the short. And then she would go “okay.” Here’s my version. So we’d work a little bit back and forth as we were going. Chris Buck: Correct me if I’m wrong, but I know that a lot of kids, when they sang Let it Go, they sang that. “A cold never bothers me anyway.” That bothered me. I think it might have been riffed off of that. And kids sing it so that IS the lyric. ‘Cause it’s like a cold, and their lives is so debilitating, and so big that it’s like, that’s not gonna bother me. I’m gonna get through this! So, it’s so cute when they do it. And I think of it as a little bit of a nod to that, too. Chris Buck: It’s a Disney character. Sometimes the animators put in things that we don’t necessarily see, or they won’t tell us. Jennifer Lee: …sometimes they’ll point it out ‘cause they need approval. And other times we’re just like, oh! Did you know there was a Mickey on that shelf? Chris Buck: Oh yes you will. I think right before it opens, like the 12th or 13th. So they not only are adorable, but they talk. ‘Cause they don’t talk in the film. What they do is there’s a recording box in there. So you talk to it and it repeats what you say, but in a higher pitch…So you can get a whole bunch of ‘em. And they could all talk to each other. But once we knew also that Elsa’s gonna create a couple new dresses, [we] had to really work on those quickly and get the designs done quickly so that we could get stuff in the store. Jennifer Lee: Hey, you know, I’m trying to teach my daughter to take it slow. So I don’t know. It’s been a year and a half and he finally just said I love you. What’s the future of Frozen and Elsa and Anna? Is there anything else coming up that we should look for? Jennifer Lee: We don’t know. We just finished the short two weeks ago. Chris Buck: The sound. And we really didn’t have much of a break before we started on this after the, the whirlwind of the feature. Jennifer Lee: But we’re working on the Broadway musical.We’re in the very early stages. I mean, there will be more songs, and Bobby and Kristen, of course, have a lot more to do with that than I do in that the Broadway musical tends to have the opposite structure where a film has 20 to 25 minutes of song, and, and the rest is little 60 pluses scenes, and the musical flips that. So, you know, there’ll be a lot of great stuff coming, but we’re really just getting started. And [we’re] helping out in the studio. The directors helped us on Frozen, and we’re helping them on their projects. We’re kind of in that place of got to stop for second and then dream again. We don’t know what we’re gonna come up with. Chris Buck: There’s the Frozen Fun that’s at California Adventure. We’re very Frozen busy. But the nice thing is that ‘cause sometimes in the past it’s been, you do the movie and it’s kind of taken away, and, and they do their thing throughout the company without any advice from us. And it’s always nice to be asked because we know these characters so well. And there are things that we tried, but didn’t work with our characters, so it’s always nice to give them that heads up. Like don’t go down that road, ‘cause it just gets kinda sticky. We just feel very busy with a lot of it. So we’ll see what’s next. Jennifer Lee: Well, I have to say it’s huge for me because my first Disney film was Cinderella. And then, and once it came on VHS, I think I played it 50, 60 times, and so then working for Disney was a dream, it was my dream when I was a kid. So to have everything come together. And [Cinderella], I was blown away by how much it was in line with the animated film. And yet, it went even deeper, and it was so beautiful. So there were a lot of very nostalgic tears last night. Chris Buck: But seeing it last night too, it felt like a perfect match with Frozen and then Cinderella. Jennifer Lee: You could feel the the inspiration from Cinderella for a lot of us. And Mike Giaimo also with art direction, and me emotionally with connecting with the strong female leads. And Chris has been in animation for a very long time [Chris inserts joke about how old he is], and been a part of a lot of the classics. All the things that make fairy tales resonate. So it, it meant a lot. Chris Buck: Mike likes Cinderella, too. But he really was sort of mad at us…in Let it Go. And Elsa’s dress transformation, right? Jennifer Lee: He wanted it different. Chris Buck: It’s too short…It should be like this Cinderella thing. And it’s, oh, he’s really frustrated. So in the short, she gets more time. Elsa gets more time to do her dress. So it’s the angle. Jennifer Lee: Mike got his angle. Chris Buck: Finally got his Cinderella angle. I think that was a fitting way to end the interview. I could have go on and on with Chris Buck and Jennifer Lee. It was like a married couple comedy act. They are a riot together! But you can tell how well they work together and how passionate they are about Frozen, the characters and the audience. And for my first dual interview, I think it was a seriously fun way to go! While no word of a sequel yet, there’s definitely a new song for your kids to sing and new snowmen to squeeze as we gear up for one of the “coolest” shorts in Disney history! So how do you get in on the Frozen Fever action? Only at Cinderella, of course! It’s like a bonus ice cream scoop on top of your sundae! So make sure you see Disney’s Cinderella in theaters starting this Friday March 13, 2015 so you can be one of the first to experience the all-new Disney Frozen Fever short! Your kids (adults too) are going to fall in love with those characters all over again ! And can someone please get me one of those adorable mini snowmen? 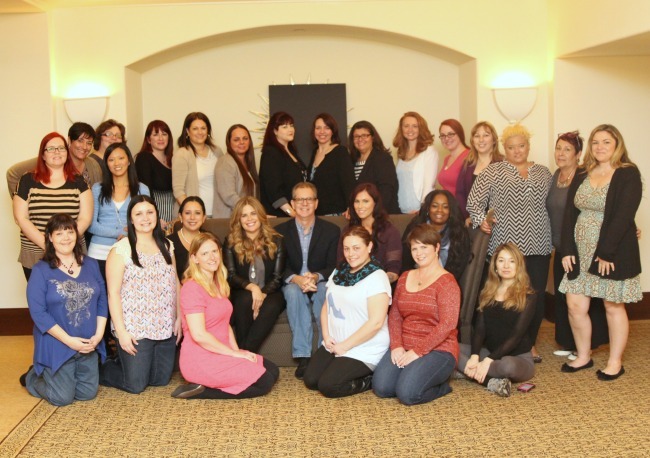 Have you been following along my #CinderellaEvent journey? Check out my own Cinderella Moments at the JCPenney Glam Ball and My First Red Carpet Experience. Stay tuned for more amazing of my Disney Cinderella interviews with Richard Madden (The Prince), Director Kenneth Branagh, Costume Designer Sandy Powell, and Frozen Fever Directors Chris Buck and Jennifer Lee. Check out my exclusive Cate Blanchett interview (Lady Tremaine) as we discuss what makes a Wicked Stepmother. 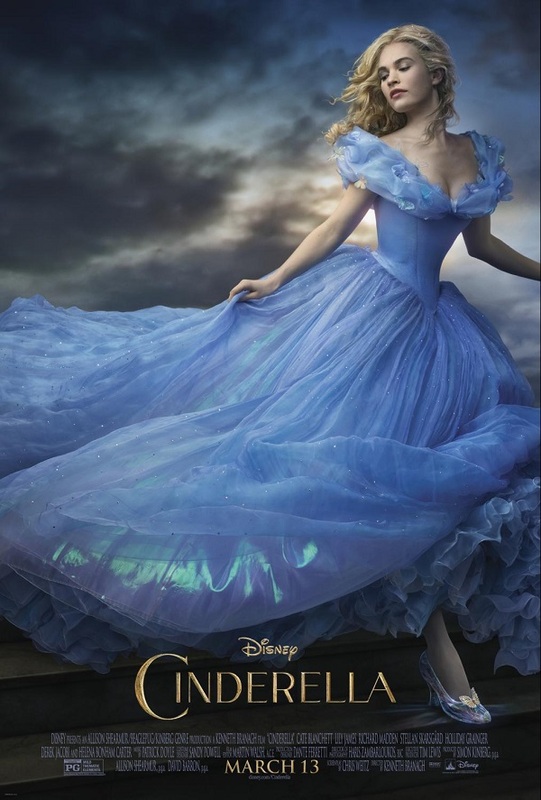 Check out my exclusive Lily James interview (Cinderella) as we find out what makes a Disney Princess come to life. Check out my exclusive Director Kenneth Branagh interview as we divulge the details and the story within the story. Are you excited to see the new Frozen Fever short? Disclosure ~ I received an all-inclusive Disney media trip in exchange for this posting. All opinions are my own. Be sure to follow Saving Said Simply via Facebook, Twitter, Google, Instagram, Pinterest and YouTube for more Disney movie updates, travel adventures and more! My daughter is really excited to catch the new short when we go see Cinderella. I’ll have to show her this interview! What a fun interview. I always love getting a peek at the creative minds behind films I’ve either seen and love or that I know I’m going to love when I see them! I LOVE down to earth people in a business like this. He buys his shirts at T.J. Maxx! I love it! Frozen Fever was adorable, but I like to call it Frozen Forever as it’s never going to end. It’s only a matter of time for Frozen 2. What a great interview. Frozen Fever will be a hit short. I don’t know any kid who doesn’t know Let It Go. It sounds like they worked really hard on the short. I can’t wait to see it for the first time. I think my younger daughter may get more excited about this Frozen short then about the actual Cinderella movie. Oddly enough I am not sick of the song either! I love frozen. My kids love frozen. So to say we are all excited for any type of more frozen would be an understatement! Yes we can’t wait to see the short and this movie! Way cool and so excited. We are so excited to see Cinderella in my family, but the Frozen short is huge on the list of must-sees. The directors sound like so much fun! Next time you speak with them, throw a sarcastic thank you in there for me too. I’m still not sick of the song! LOL, I’m excited for this. We LOVE Frozen here! What a fun interview, and I love the new clip! It is just one of those movies that makes you smile! This is gonna be great. Great interview. I am so excited to g o see Cinderella and the Frozen Fever short. My daughter and i are going to go together. This is such a great interview. I am excited for Cinderalla. I think the Frozen short will be cute, too. But I can honestly say, I am pretty much over Frozen. I need a long rest. I love Disney short movies! Frozen Fever sounds like it’s gonna be a good one! Can’t wait to see Cinderella too! I know a few kids who can’t wait to see the new short! Frozen Forever is what it seems it will be. What a fantastic event! We are so excited for more Frozen anything! Hopefully we will get to see Cinderella this weekend! LOL at Chris Buck..he is a real hoot for sure! I am glad Frozen is coming out with another production because my kids LOVE the first! You know, I don’t even know if I have heard the song, I heard the movie was awesome! My daughter loved it, great interview. I like the “I still buy my shirts at TJ Max.